After stressing that the preservation of the autonomy of the EU legal order is “not a synonym for autarchy” (para 59), AG Bot explains why the ICS is needed politically. He goes on to deny that Achmea has any implications for the current question; and consider the safeguards included in CETA sufficient to ensure the preservation of the ECJ’s exclusive jurisdiction over the interpretation of EU law. AG Bot then goes on to distinguish Achmea from the case at hand. In Achmea, the question related to an intra-EU Bilateral Investment Treaty (BIT), whereas the current question is about an extra-EU agreement concluded by the EU itself. On the basis of such distinction, he rapidly concludes that the “approach in Achmea cannot be transposed to the ICS” because (1) the premises that must guide the reasoning are different (mutual trust versus reciprocity) and (2) the applicable law before the CETA Tribunal consists only of the agreement itself; EU law can only be taken into account as a matter of fact, and the interpretation of domestic law is not binding (para 106 to 110). After having discarded any implications of Achmea for the present case, the AG looks at the safeguards included by the Commission to accommodate one of the key constitutional flaws of ISDS under EU law: its incompatibility with the EU Treaties. 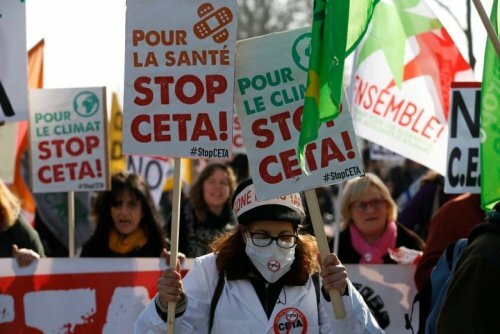 Article 8.31 of CETA seeks to preserve the powers of the ECJ and the autonomy of the EU legal system by limiting the powers of the Tribunals in relation to domestic law. The AG more or less repeats the arguments put forward by the Commission during the hearing and, 7 overall, considered himself satisfied with these safeguards. He concludes that the ECJ’s exclusive jurisdiction has been sufficiently shielded.